cardigans and kids: pumpkin cheesecake recipe. I love cheesecake and I love pumpkin and I have been having a hard time trying to find a recipe that put the two together to my liking, finally I got the nerve up (and cream cheese was on sale for $0.69/8 oz. bar) and made the recipe I thought/hoped would work. So this recipe is just in time for Thanksgiving and Christmas, and any day of the week you are craving some yumminess. In a medium sized bowl, mix the ginger snap crumbs and melted butter together. Press into the bottom and up the sides of a 9 1/2 in. spring-form pan. Refrigerate until filling is ready. 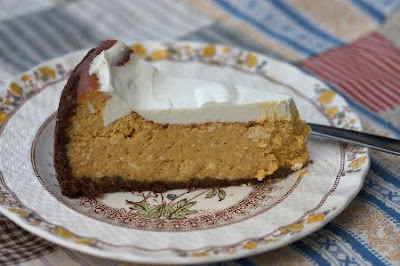 In a standing bowl mixer, combine the cream cheese, pumpkin, sugar, flour and dry spices and beat until everything is . Do not over beat. Add one egg and a time, mixing after each addition. After all eggs and yolks have been beat in. Add the cream and cooking wine and beat until mixed thoroughly. Pour the batter into the crust and put in the oven for 10 minutes. After 10 minutes, open the oven door and turn the heat down to 350 F. After the oven has cooled a bit close the oven door. 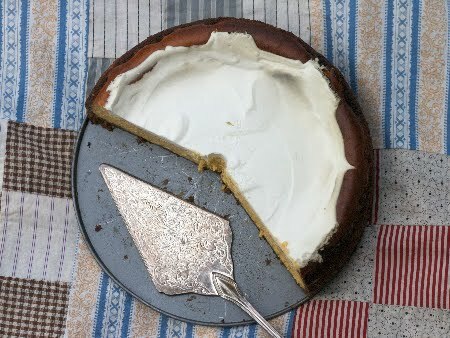 After you have turn down the oven temp, begin to bake for 50 minutes (or until the outside of the cheesecake is firm and the center is still a bit wobbly). Carefully rotating every 15 minutes. After cheesecake has baked the 50 minutes, remove from the oven and mix the sour cream and sugar together. Spread the sour cream/sugar combination over the top, smoothing with a rubber spatula. Return to oven for 5 more minutes. Not only is this topping delicious, but it covers any cracks in your cheesecake. Turn the oven off, crack the door and let cool in the oven for at least an hour (until the cheesecake has cooled). Usually after 2 hours, I cover the top and chill in the refrigerator for at least 8 hours. I usually make mine the evening before I want/need it so it has plenty of time. *You can also crush more ginger snaps and put on the top before serving.